T-bones, sirloins, filets and strips—these are the beef cuts referred to as “middle meats.” Such steaks make up 12% of the carcass, but represent just under half of its total value. That and the difference in cooking method lead many to believe it’s the only place where beef grades matter. 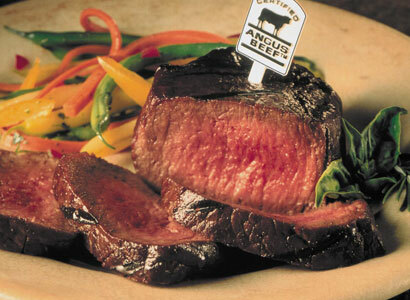 Urner Barry reports the wholesale Certified Angus Beef ® (CAB®) brand premium. In 2012, some of the most popular CAB end meats from the round and chuck brought in 11 to 13 cents above Choice. The wholesale premium for a CAB tenderloin was 85 cents. In 2008, the premium for a CAB bottom round flat above Choice was 6 cents; five years later it was nearly double that at 10 cents. The trend holds true for other end meats, too. Today’s economics may show a wider spread, but the same opportunity, he says. “This product is of high enough quality that it’s worth it,” O’Diam says. The proof is in the sales numbers that show end meat receipts were up 7% last year. In 2006, Colorado State University analyzed tenderness on 17 different cuts grading either Select or premium Choice. Nine end cuts from the chuck and round with higher levels of marbling had significantly better tenderness scores. Few studies exist on the flavor and juiciness differences in varying quality grades of end meats, but O’Diam says consumer feedback and parallels between middle-meat research tell the story. “Marbling makes a massive difference in terms of eating experience, even when we get to those end meats, and the sales numbers show that,” O’Diam says. The national economy affects meat case decisions, too. “People are wanting to spend less because they have less disposable income, but they still want quality,” Longo says. “As that premium continues to increase, it proves quality pays,” O’Diam says. It also helps explain the upward trek of the end-meat premiums. “Middle meats are still our bread and butter, but as the price of CAB increases, the ends have to carry the burden for more and more of that price increase,” he says. As with any cuts, there is seasonality to the pricing and export influences. Trade agreements have recently opened markets like Colombia and Chile to high-quality U.S. beef, and that has propped up values of specific end meat cuts, like the chuck roll. That is also a popular subprimal for whole-muscle grinds, or premium ground beef, which is a category that has grown in the past decade. “CAB has become more widely known and people know there is a benefit to buying premium beef,” Longo says. “I do think that branding matters here. An end cut is a piece of meat and do you want something that is No Roll or do you want something that has some marbling in there? “We know that marbling is flavor and tenderness,” he says.